I had one around, (exactly this: https://www.sparkfun.com/products/12574) and tried interfacing. 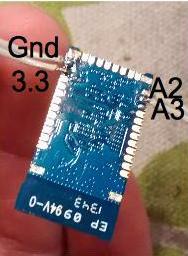 It's been pretty easy, I just connected pin 11 to 3.3v, pin 12 to GND, pin 13 to A2 and pin 14 to A3 and that was it. With this code I can echo stuff written to the corresponding serial port on the pc. What is the goal? If you're just trying to control espruino over Bluetooth, you can solder an hc-05 onto the bottom of the espruino board, pair with it and connect via the ide. Do you think it's pin compatible with the HC-05? It's not pin compatible (I actually have a photo of how I wired it, but I never managed to understand how to upload to this forum). And yes, I could put the serial there.. but I need it for midi input instead. Hi Loop, on the photo front create an account on something like photobucket (photobucket.com). Free. Upload the photo there. Grab the link from photobucket and paste in to the popup that appears when you click image. Yes, that works (I just tried) but to embed an image in the reply itself the "Image" button wants to point to an http:// address. Would be much more convenient if it could grab an image from the local device and upload it somewhere ! Cool! Enjoy the wiring photo in all its dubious glory! it seems it can be used as bluetooth hid device from firmware version 6.03+ ( keyboard, gamepad, mouse, mouse+keyboard combo, digitizer, sensor, "use cfg* ?" ) additionally to SPP. a quick update on the subjetc: I just finished writing a USB HID GamePad module ( yaaaaaayyyyy! ^^ ), and I'll digg that RN42 thing as soon as can do. So you wrote something that creates a new E.sendUSBHID function? If so, would it make sense to just prepend those first 3 bytes, rather than making the function behave differently? Sorry, I just edited the above code excerpts to better reflect what has to be tried on the RN42 setup and the puck.js setup.